Oh my, what an ambitious undertaking this was! Those of you who have an appreciation of the Victorian stories of yesteryear are in for a treat. William Meikle has cleverly put together a collection of short stories that are each written in the style of the author that is supposedly telling the tale. 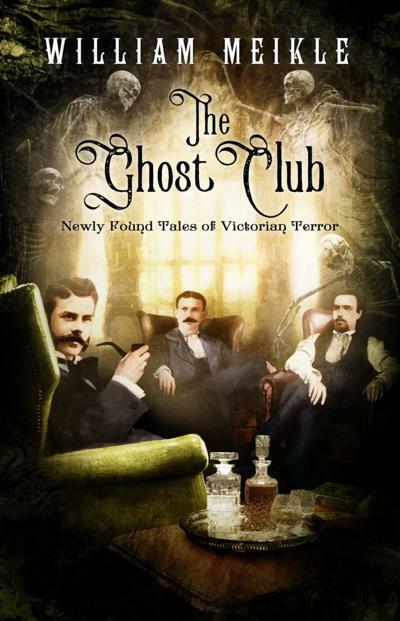 The Ghost Club is comprised of three members, Henry James, Bram Stoker, and Arthur Conan Doyle. This elite “literary dining club” extends invitations to others at a price, which is the accepting invitee must tell a ghost story while dining. Just looking at the TOC you know you are in for a treat, just imagine being a fly on the wall for one of these gatherings! Meikle has done a wonderful job in keeping with the cadence of each author. I loved each of these tales especially since I am familiar with most of these authors and have greatly enjoyed reading their words in the past. These are all good old-fashion tales that don’t rely on shock or blood and guts to get your attention. Instead, you find the quiet subtlety of supernatural occurrences that I find so much more effective in invoking a chill. Now that winter is approaching us this would make for an excellent bedtime read with the lights turned low and the blankets piled high. “Tis the season for giving, so why not give yourself a good read! Available in both paperback and e-book format, you can pick up a copy HERE! I would like to give a nod to Ben Baldwin for capturing the essence of the era with his brilliantly done book cover!